I first got interested in this story when I heard Karen Kain interviewed by Lisa garr on Coast to Coast in July 2014. 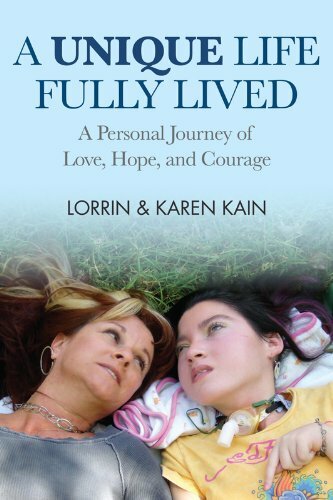 I researched the Lorrin Kain story a bit on the Internet(including the website www.Lorrinsworld.com) and knew that I had to read the book.Karen Kain has become something of a darling in the anti-vax movement. More about hat in a moment. I knew that it would be difficult to write this review, because I have serious misgivings about Ms. Kain. Yet because of what happened, she is a sympathetic figure and questioning her in any way seems taboo. Still I feel that I must question not just her views on vaccinations(or at leas her willingness to be associated with anti-vaxxers) but many other things. Lorrin Danielle Kain was born on March 15 1994 in Southern California. At age 6 weeks she got a routine baby DPT shot. Soon after she began having seizures, bad and frequent ones. The vaccine was apparently defective, part of what's called a "hot lot." For the next 15 1/2 years. Lorrin would have a seizure disorder and be seriously disabled. She would never walk or talk and would always be in diapers. She suffered from cortical blindness(as I understand it, this means the eyes are OK but the signal between brain and eyes doesn't work right.) She had a trach tubes. She had a gastric tube, though how she ate isn't made completely clear. It's one of many things that are frustratingly vague in this book. I dont think that Lorrin had the use of her hands either. This isn't completely clear because Karen claims that one of the ways Lorrin communicated was with a "thumbs up", particularly on clothes-shopping trips, of which there were many. The family received help from the Vaccination Compensation Fund, but also Medi-Cal. this was the subject of a court action, the facts of which are easy to find on the Internet. It appears that the Kains were indeed trying to get more than they were entitled to. Karen Kain obliquely references this but basically blames one of the lawyers. Be that as it may. What is clear is that Karen spent money like water. Some necessities, such as a heavy van with a wheelchair lift, were indeed expensive. And there were day-to-day needs--diapers,medicines, etc. During the first 7 years of her life, Lorrin spent a good deal of time in the hospital, often with pneumonia. Of course no one would deny her these things. But then there was Karen's clothes mania. She claims that one of Lorrin's favorite pastimes was shopping. What seems more likely is that one of Karen's favorite pastimes was taking Lorrin shopping. An example of one of her frivolous expenditures was mismatched(same style--different colors) shoes for Lorrin, which she decided would be cute. This meant buying two pairs. Since Lorrin didn't walk, it's unlikely she would wear out all four. Ms. Kain groused continually about being called on the carpet for her expenditures. But you can hardly blame the state of California. Stuff like this is what caused them to go broke. Karen spent $800 on quincenara dress for Lorrin. The family was neither Hispanic nor Catholic, but since Karen was aware that Lorrin probably wouldn't live to adulthood, she threw a lavish quincenara for her when she turned 15. If there was one thing Karen loved more than shopping and doing wild stuff with Lorrin's hair, it was throwing parties. She gave a posthumous Sweet 16 party 3 months after her death, as well. I never met Lorrin personally, of course. Nor have I met her mother--I only heard her interviewed on Coast to Coast. But she struck me as someone out of touch with reality, perhaps dangerously so. In the book she accused Lorrin's father Tom(the two divorced at some point during Lorrin's life) of being an alcoholic and drug addict, and in fact, even stealing Lorrin's anti-seizure medicine for himself on one occasion. The man is conveniently dead and can't defend himself against these serious charges. The book contains many photos, but not one of him. He is not mentioned inthe acknowledgements. these honors are reserved for Karen's new boyfriend(now husband), James. Nor is there any mention of Tom's side of the family. It seems unlikely that they're all dead. We will probably never get Tom's side of the story, but my hunch is that he disagreed with some of Karen's decisions regarding Lorrin and this was the real reason for their breakup. Karen Kain strikes me as a person who punishes those who don't go along with her. And I suspect that she often got her way by merely wearing people down. Those who don't allow themselves to be worn down are slandered or frozen out. So it often is with those who create their own realities. As I said in the beginning, it's impossible to say exactly what one would do in Karen and Tom Kain's places. The challenges of nurturing a child like Lorrin are unimaginable for most of us. And so is thet ragedy of having a loved one hurt or killed by a defective vaccine. But I have always been a believer in staying in touch with reality. There was a time when some of Karen's schemes, such as entering Lorrin in a labor-intensive pre-teen beauty pageant would have been seen as mocking her, perhaps even a type of abuse. I wasn't there, so I won't go that far. It's worth noting, though, that in addition to prodigious spending, Karen never met a new-age gimmick she didn't like--angels, shamans, dolphin therapy, you name it. And now she's a big name on the anti-vaccination circuit. Anti-vaxxers are probably responsible for most of the glowing blurbs and reviews of her book on amazon and elsewhere. But it's hard to believe that they even read the same book I did. Return to Potpourri book box.